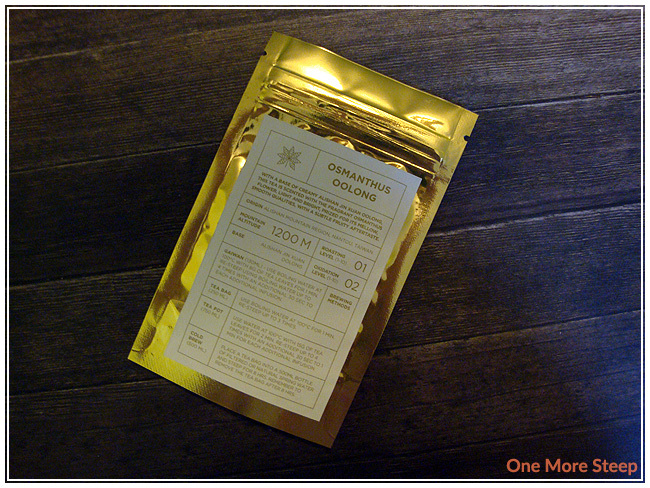 I received this sample of Tea Ave’s Osmanthus Oolong for free, a review of the tea was not requested by the company. Osmanthus Oolong is described as having a “base of creamy Alishan Jin Xuan oolong, this tea is scented with the fragrant osmanthus flower”. I’m not entirely sure what osmanthus flowers smell like as I’m just not familiar with the flower, but Osmanthus Oolong has a very light scent to it. It’s light with a fruity and floral smell – it smells like apricots and peaches, with a sweet floral scent that I just can’t place (I am assuming that it’s the osmanthus). The dry leaf is beautiful, and there’s small orange floral pieces mixed in with the oolong. Like the other labels that the other Tea Ave samples I have reviewed have had, the one for Osmanthus Oolong is also quite detailed. The origin of this tea is Alishan Mountain Region, Nantou, Taiwan with a base of Alishan Jin Xuan oolong. It also has various brewing directions (gaiwan, tea bag, tea pot, and cold brew). There was enough tea in the sample bag for my small pot. Tea Ave recommends steeping in 100°C (212°F) water for 2 minutes. This tea resteeps up to 4 times with an additional 30 seconds to 1 minute for each subsequent resteeping. I steeped my pot of tea for 2 minutes. In a word, yum. 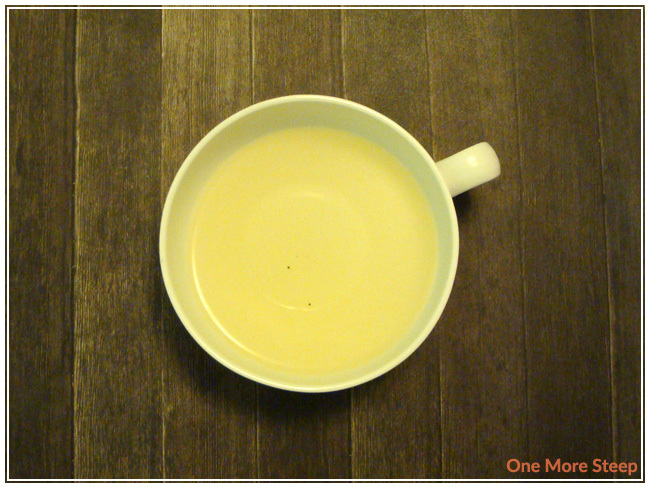 Osmanthus Oolong steeps to this beautiful clear golden yellow. It has a bright and fresh aroma to it – very similar to the dry leaf with the apricots and peaches, with floral undertones. There’s a creamy sweetness to the oolong that works well with the apricot and peach taste. I think that Osmanthus Oolong is tasty in that it coats the mouth well, there is no bitterness or astringency and I quite like it. I sipped this pot of tea over the course of an hour, just refilling my cup over and over again and it put a smile on my face every time because I really enjoy the creamy mouthfeel with the bright fruity taste. 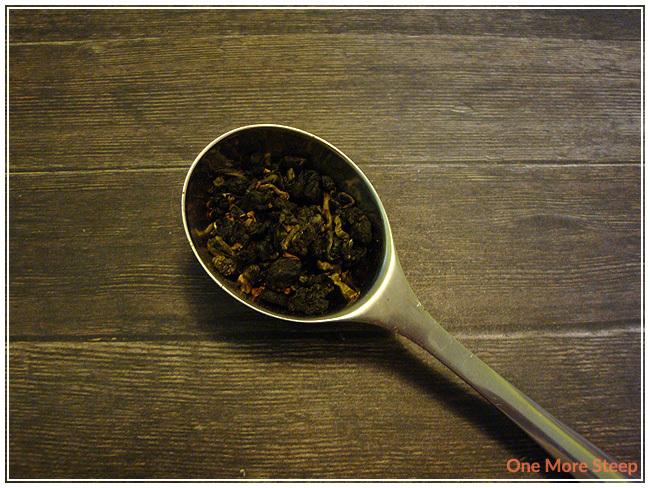 Osmanthus Oolong does not disappoint in its ability to resteep! The label on the sample baggie said that it can be resteeped up to four additional times – I did just that! For those that haven’t resteeped teas before, here’s what I did: initial steep – 2 minutes; 1st resteep – 2.5 minutes; 2nd resteep – 3 minutes; 3rd resteep – 3.5 minutes; 4th resteep – 4 minutes. I found that the additional thirty seconds with each steep was just enough to develop the flavours. The first and second resteeps were actually more bright in terms of the sweet apricot and peaches flavour that was present in the tea. It does really well with being resteeped. I loved Tea Ave’s Osmanthus Oolong. The fruity smell and taste of apricot and peaches is divine, it really adds a little something to the oolong that makes it enjoyable. I think it’d be a great tea with pastries, it definitely is a tea that you should have when you have the time to have a nice long tea experience. It resteeps very well, so don’t let the cost scare you off from trying the Osmanthus Oolong! Being able to resteep it four times makes the value of the tea worth the cost. It tasty with it’s fruity flavours that don’t overwhelm the palate, and it makes for a great tea to enjoy again and again throughout the day.